“I want to watch my photos on TV for showing to all people in the room with music in an interesting way, so people will be fascinated by my photos. So how can do that? ” I read this question from one Q&A website. Maybe other people also have the same problems. In this Era, it is so easy to snap photos to remember every special moment, like wedding, birthday, graduation etc. And we needs a tool to help us to enjoy and share our precious photos in an interesting way. DVD Photo Slideshow is designed to help make photo slideshow DVDs and create photo videos for enjoying and sharing. In this following article, I will show you how to turn your photos into an eye-catching slideshow with music, transitions, beautiful theme and burn it to DVD for watching on TV or DVD player. Step 1.Launch DVD Photo Slideshow on your windows computer. 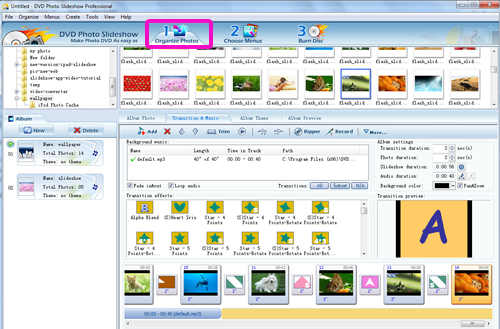 Put the photos you want to use in a folder, find the folder from the File Folder List Panel(The upper part of the software screen), open the photos folder and drag photos to “Photo Album” screen. After importing photos, you can arrange photos order by dragging them to the places where you want to put. Change transitions for the slideshow. The software will apply random transitions to all photos once photos are imported. This feature will be very useful for a slideshow with hundreds of photos. If you like, you can change transitions with ones you like. The program provides over 300 kinds of transition effects. Add background music. Click “Transitions &Music” under “Organize Photos”, then click “Add” to import songs from your computer. Also you can Rip an Audio CD or Record sound as background music. Trimming music and arranging songs order is available. Set slides time and transitions. In the “Album Setting” under “Transition & Music, you can set the slideshow duration, then match the slideshow duration with music duration to make them play in pace with each other. Click a photo under “Album Photo”, you can set the time for each slide. Choose an album theme. There are different beautiful themes available, such as Wedding, Christmas, Thanksgiving Day, Valentines’ Day, Graduation etc. The theme can both highlight the point and decorate the slideshow. Switch to tab “Choose Menus”, here you can choose a menu and customize it. The program provides over 90 kinds of DVD menus for choosing. If you are not satisfied with them, you can import a image from your computer as the DVD menu background image.Then you can edit the menu, like setting background music for DVD menu, editing menu title. Then preview the slideshow to check if it meets your needs. If not, go back to modify the effects. 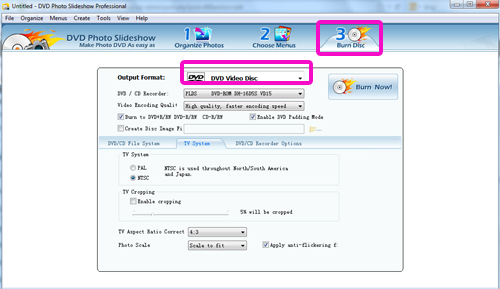 Go to tab “Burn Disc”, then click the Output Format drop-down list and choose “DVD Video Disc” . If you want to play the Slideshow DVD on TV, you need to choose “NTSC” or “PAL” under “TV System”. Also you can choose 4:3 or 16:9 TV aspect ratio. After that, click “Burn Now!” to start burning process. After burning DVD is finished, you can play the slideshow DVD on your computer through hard drive or watch it on TV via DVD player. This entry was posted in DVD Photo Slideshow and tagged DVD Photo Slideshow, make photo slideshow dvd with music, make slideshow dvd, photo slideshow and dvd on December 4, 2012 by Sarah Jablich.